Years ago, Shira was given a no-frills sling backpack at a conference she attended. Being a fan of all things gear and bags I was curious to see if it was useful. I tried it in a number contexts while hiking, traveling and biking. In all cases I found it to just too small to be useful, or too uncomfortable to wear. One day, though, I needed to head out of the house and I was wearing exercise clothes; that meant no pockets to hold all my usual crap essentials. I tossed the items in the sling bag and off I went. To my surprise, the bag worked great. Sure, it was small, but it fit the contents of my pockets just fine. And not being overlyful meant that it hugged my back and stayed out of my way. The bag was all black, and basically a backpack, so I didn't suffer from oh-dear-I'm-carrying-a-purse-and-everyone-is-laughing-at-me'itis. And so this freebie bag became my goto bag when I ran out of room in pockets (or didn't have them) and just needed to carry one or two things. Need to grab just my DSLR and an extra lens? The bag was perfect. Heading to the gym and want to have my wallet and a water bottle handy? Again, the bag worked ideally. I even started to put the somewhat pathetic features of the bag to use. The tiny mesh water bottle pocket on the side wouldn't come close to holding a real water bottle. But, it became the perfect spot to stash my car keys. The mesh managed to keep them secure, but visible. And the silly open pocket on the front? It worked great for clipping a blinky light to it, to add some visibility at night. There was only one real catch to the bag: I really disliked the fact that it had the name of the conference printed in large letters on the back. Not only was this really poor OPSEC, but it wasn't even a conference *I* attended. So, every once in a while, I'd go searching around for a replacement bag. Try as I may, I could never find anything quite the same low profile and the right size. Sure, I wanted to look like Indian Jones, but I was quite certain I wasn't going to pull off that look. For $11 (and free shipping both ways), my annoyances could be resolved. And I almost pulled the trigger. While looking at related items, I was lured into actually purchasing a similar bag. 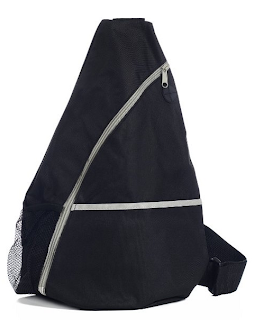 Specifically, I picked up the Port & Company Honeycomb Sling Pack. At $8.08 (and free shipping both ways) in navy blue, it was too good a deal to resist. And I figured I could always fall back on the plain old black bag if I'd preferred. Note the water bottle is next to the bag to give some sense of scale. There's no internal photos because, well, there's nothing internal. It's just one big pocket and one small pocket. You can see a commercial for the bag on YouTube. It's definitely a shorter, more squat bag than my black one. I find this annoying, as it gives it more of a purse look than a backpack look. Still, I think it works. 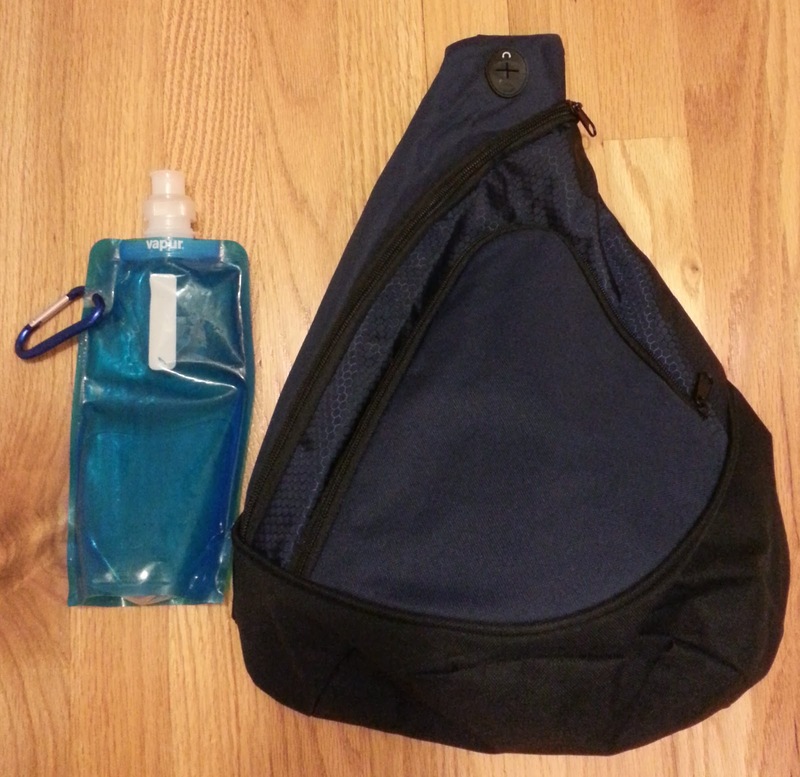 Gone are the useless water bottle pocket and flap pocket, which I had put to use and miss. I'm sure the zippered front pocket will be useful. Probably more so than the extra pockets on the black bag. Size wise, the navy blue bag works is pretty much equivalent to the black bag. Even though it's shorter, it seems to have slightly more depth. It fits my DSLR camera gear or my netbook; but not both at the same time. Which is the whole point. It holds my usual pocket related stuff, without any issue. The sling attaches to the left side of the bag versus the right. I find this disorienting, but probably not a big deal. The bag doesn't get filled up enough to get heavy, so it doesn't really matter which shoulder it's slung over. With the black bag, when I slid the bag around to access it, the zipper was on the downward facing side of the bag. That means that opening it up while wearing the bag meant that stuff was almost certainly going to fall out. With the Port & Company bag, when I access the bag, the zipper is on top. Hurray! No more stuff randomly falling out. The navy blue color is just as low key a the black color. I'd feel just as comfortable bringing this to the gym as to a business meeting. The quality and sturdiness of the navy blue bag is remarkable considering it was $8. This bag may not last forever, but given its price, it's really well put together. I suppose it mainly boils down to this: is it worth trading the more squat bag shape for the ability to open it while wearing it? And I think the answer is yes. So, for $8, I do believe I've got a new when my pockets just won't hold all my crap bag. Which, given all the stuff I schelp, is more often than you might expect.